You would think that with the many sacrifices parents must make in caring for a disabled child, activities like bike riding would not be a major concern. It’s hard enough teaching a disabled child in painstaking, time consuming methods what other children might pick up instantly, so why make things more challenging? Of course, it isn’t that simple. For many parents, biking has become an activity that both they and their child can enjoy; but my brother, Jesse, is 11 and has autism. He’s physically capable, and, if the planet was deserted, he could ride a two wheeler just as well as the next guy. However, once you bring in people, cars and traffic laws, things get complicated. Jesse doesn’t understand much. He wouldn’t be able to acknowledge the danger of other vehicles, and he certainly wouldn’t be able to grasp the concept of stopping at a stop sign or traffic light. Jesse has to share a bike with someone a bit more competent. This sharing wasn’t a problem when Jesse still fit in the child’s seat that sat on the back of my dad’s bike. However, as he got older and bigger, it became clear something else was necessary. First, my dad bought a tag-along bike, which is a normal bicycle minus the front wheel. It attached to the back wheel of my dad’s bike and allowed the two to ride together. But, this solution was far from perfect. 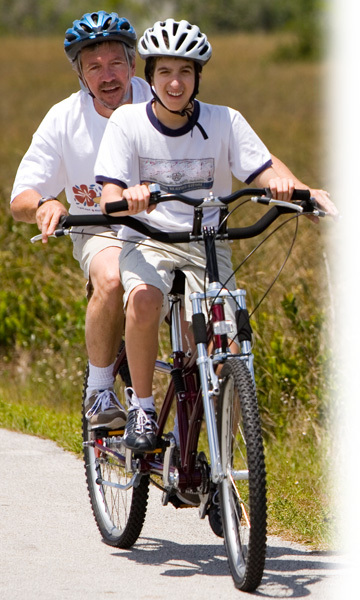 Because my brother was behind my father, Jesse could get away with not pedaling since my dad couldn’t always see him. Jesse also sometimes let go of the handlebars, putting himself at risk. When my dad did look back to check on him, the two sometimes crashed since my dad would not be looking ahead. Then my dad came across the Love Bike (now known as The Buddy Bike), a tandem bicycle with two sets of handlebars in the front and a backseat that is slightly more elevated than the front seat. These two unique differences allow my father to sit behind Jesse while still retaining control of the bike’s steering. Jesse now looks out towards an open view, unblocked by my father’s back, and my father now interacts with Jesse without risking a collision. They’ve been riding this way for two years, frequently riding as much as 18 miles a day, and they both love it. My father purchased the patent for the Buddy Bike in 2005 and is attempting to raise awareness of the Buddy Bike’s benefits for both disabled children as well as those who enjoy riding together with a parent. He is the managing member of Buddy Bike LLC. I’ve watched my father devote significant time to starting the Buddy Bike business, and I sometimes wonder why he does it. He must know that bike riding, though beneficial to Jesse’s physical health, will never cure Jesse’s mental impairment. Similarly, the bike won’t cure a child of Down syndrome, hearing loss, or blindness. Why, then, does he put so much work into it? Maybe he understands that by not letting my brother’s problem interfere with this activity, he’s assuring my brother that he’ll always be on his side, no matter what. Maybe, by raising awareness of the bike, he’s trying to get the world to understand that there will always be ways of getting around these large, burdening obstacles. Or maybe he just really likes bike riding, and doesn’t think anyone should have to give that up.